How to work with gift cards? In the Promotion section, click Create gift card. The gift card setup form opens. Name is the name for the map. It is shown on the sales form. Example: Certificate $500. Description: This text is also shown on the map. Describe in it information about services or promotions. The description can be left blank. Redemption time is the validity period of the gift card from the time of purchase. Message subject is displayed in the subject of the recipient's letter. Message template. Use the ready-made message template. Make changes to the template, install the picture. Terms and conditions. 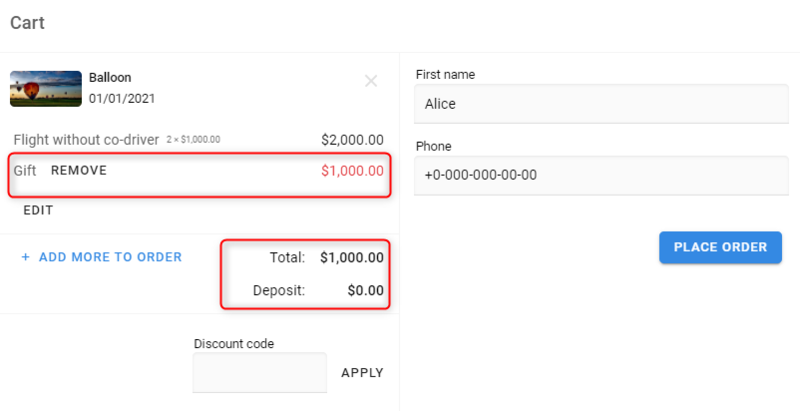 Write the text, under what conditions the discount will operate. Before buying, the client will need to accept these conditions. 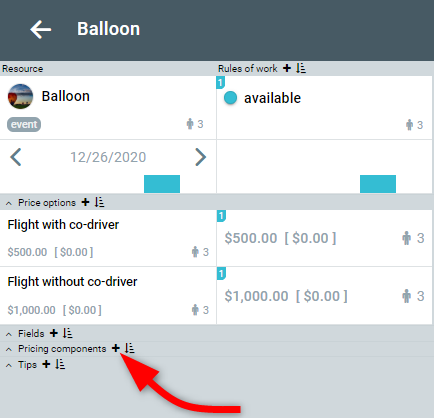 The Widget tab is available on the Business plan, since it requires payment cards to be connected. On it you can stylize the form for your site. Choose a theme or specify your CSS styles and see the result here. Then copy the widget's code and paste it into the desired section of the site. 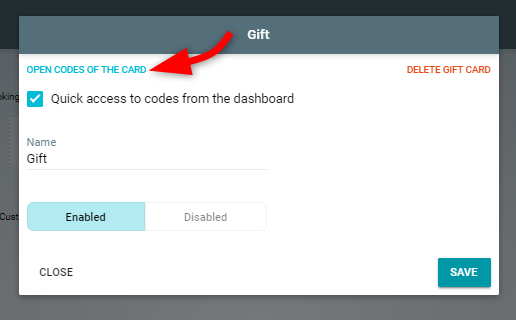 When buying a gift card from the site, the code is generated automatically. ook at the generated codes and add your own if necessary. To do this, in the map settings, click Open codes of the card. The table with codes opens. Unfinished card purchase code is turned off. 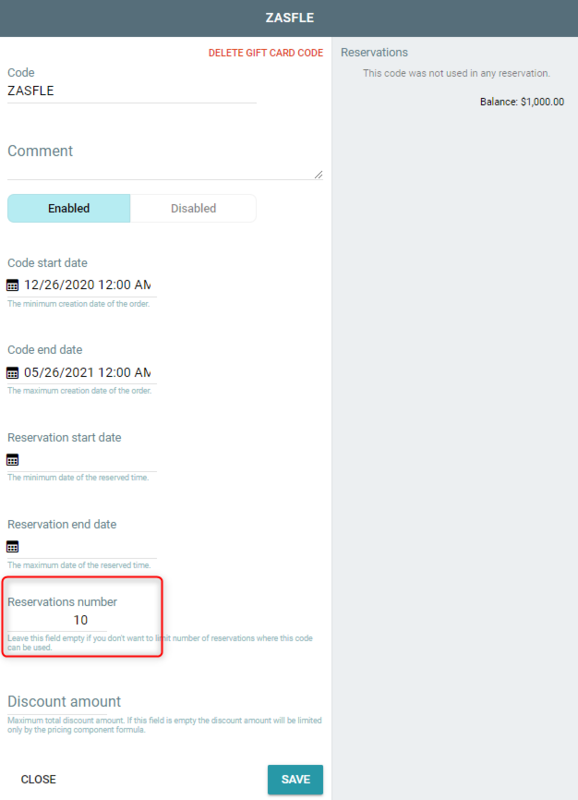 The disabled codes are displayed in gray. To create the code, click the Create code button in the upper right corner. On the configuration form, specify a unique code. It should not be repeated with any code in the means of promotion. Specify the time of the code action and comment. If the field for entering the code is left blank, it will be assigned automatically. The code can be used 1 time. Now open the resource configuration. Create a pricing component. Click +. The configuration form opens. 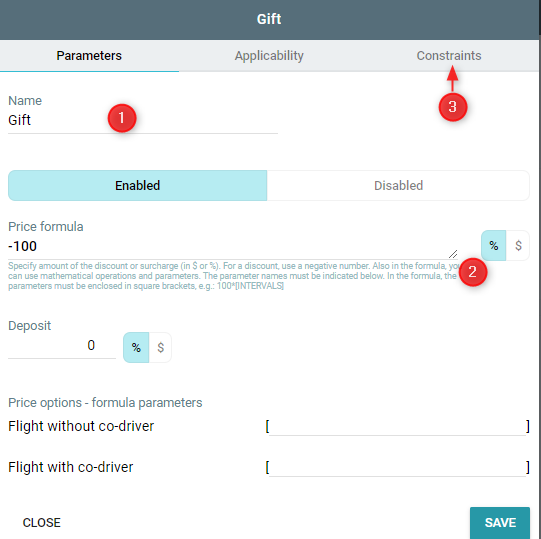 On the Parameters tab, enter a name, a price formula, and click the Constraints tab. The name will be shown in the order. Price formula: -500 and $. 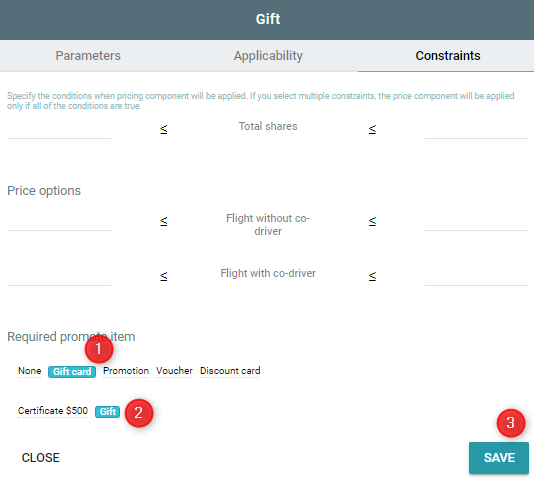 On the Constraints tab, select promote item the Gift Card. 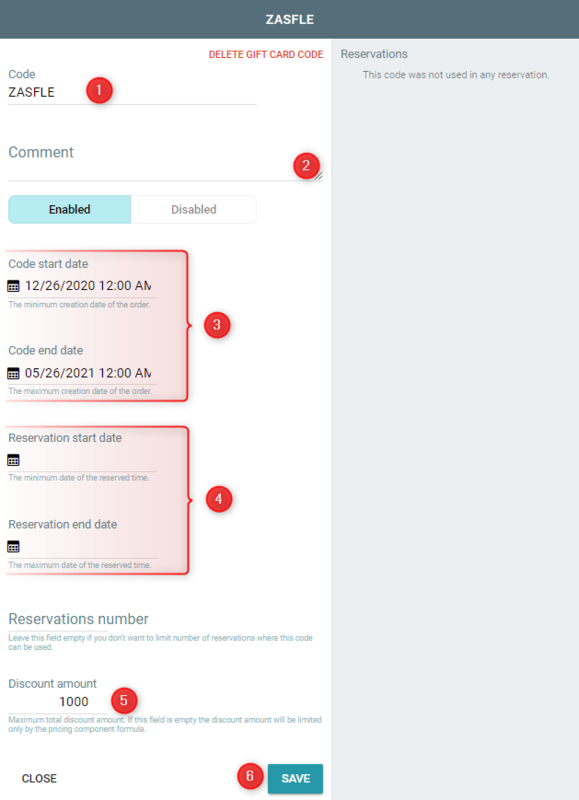 Create a test order and apply the code. The discount was added, and the total amount became smaller. You can open the code and see what order it was used for.